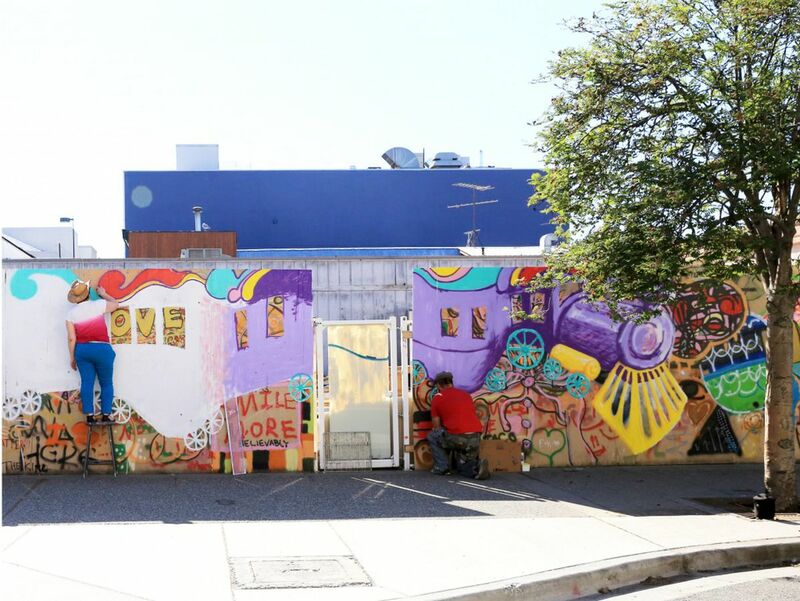 What was once a stark plywood wall covering up a defunct business on the corner of 5th Avenue and D Street turned into the grounds for civic engagement and artistic growth. 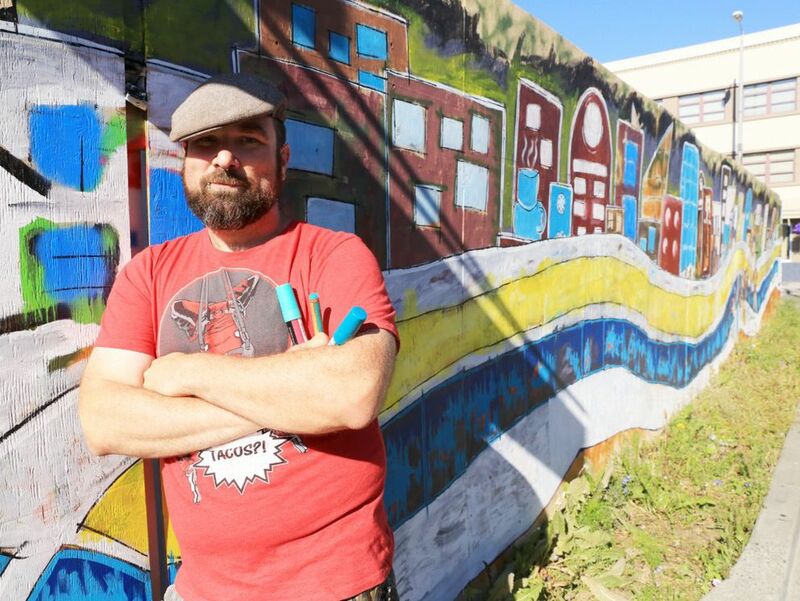 George Martinez Jr. saw an opportunity and teamed up with the Downtown Anchorage Partnership Ltd. for support and funding to jumpstart the mural project. 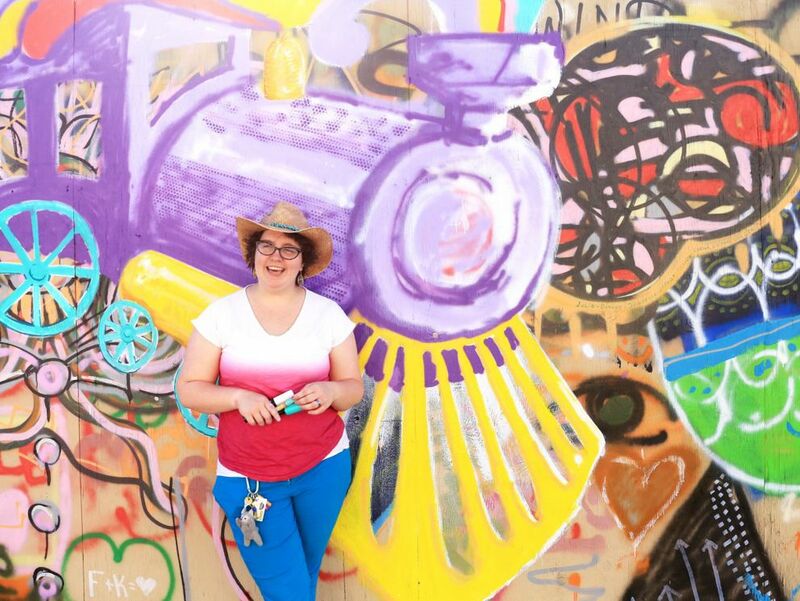 Vanessa Sweet and Ted Kincaid, active members of the Anchorage Artists Co-op, created the mural design with spaces that allowed folks from the community to add their own paint strokes. They opened the wall on a First Friday in July. At least 30 kids along with their families painted. Passerbys were surprised to be invited to join. "Seeing these young folks and imagining to themselves what they can do is powerful," said Martinez. "Art is the obvious tool for engagement. This wall represents the paradigm shift in community art in that it moves the city forward positively and inclusively." Having people walk by and viewing my art didn't necessarily change how I looked at it. Some would stare and some wouldn't notice at all. When they did engage, it was great. I've met a lot people in these five days. People from out of town and in-town. I met this guy named John; he was Inupiat. He sat next to me and told me some personal stories. He talked about the people who've died in his family. We connected. It was human. I gave him a pen and he put down the name of his family members. Initially, we didn't know we were going to intrigue the community in this way. I like the thrill of live performance art. When people are in the background, it helps me see the problems in my art pieces. Originally the mural was supposed to be an art-deco style with a lot of line work. Then there was a lot of feedback from people walking along the sidewalks and it started evolving into what it is now. This project was a great way to show the public what the Anchorage Artists Co-op is about. We want people to know that we are an Anchorage beautification force and that we're accessible. We want to create a viable vocation for artists in the community. "This is what I love about Alaska: There are so many opportunities. Alaskans are dreamers. They see opportunities in people. They don't let weaknesses get in the way of achieving goals." "Anchorage is wonderful—big, but small. Artists know each other and a lot of them are open. It's all about how you feel you can connect and make a difference. I live by this mantra: 'Art is a verb.' You have to do it. Whether it's good or not, it doesn't matter. Somebody somewhere believes that it's good. It's the best outlook you have." This article was originally published in 61°North – The Arts Issue. Contact the editor, Jamie Gonzales, at jgonzales@alaskadispatch.com.